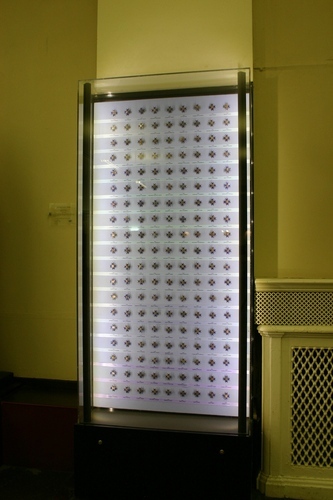 This beautiful display of over 300 hundred "Nightingale Badges" can be seen in two showcases in the Central Hall of St Thomas' Hospital in London. "Dame Alicia Lloyd Still, who was then matron of St Thomas’ Hospital, designed the ‘hospital badge’ in 1925 and it was first struck in the same year. 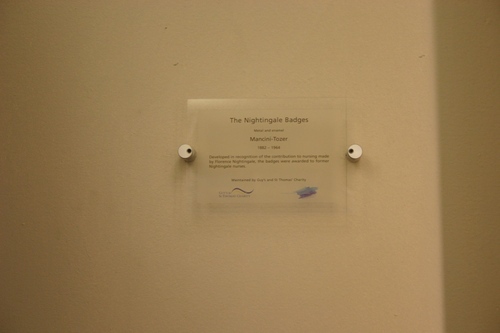 The badge was awarded to nurses who qualified from the Nightingale Training School, St Thomas’ Hospital and who had also passed a hospital examination and served for a period (usually one year) as a junior staff nurse, or ‘red belt’, within the hospital. More recently, the badge has been awarded to nurses and midwives who have trained at the Nightingale Training School or one of its successor organisations. Many members of the Fellowship and other Nightingale nurses are proud to wear the Nightingale badge which is recognised world-wide as a symbol of nursing excellence. The design of the badge is taken from the eight-pointed cross of the Knights of the Hospital of St John Of Jerusalem (now the Venerable Order of St John of Jerusalem). 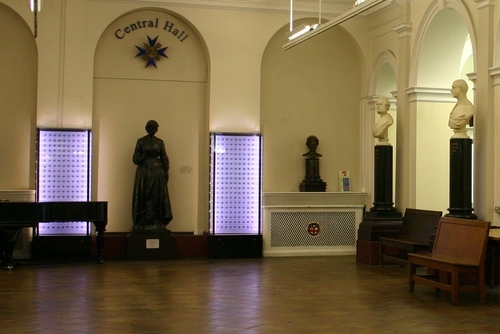 This ancient organisation was granted a Royal Charter by Queen Victoria in 1888 and is best known today for its work as the St John Ambulance. In true Victorian style, the parts of the badge were ascribed meaning. The four arms are to symbolise the Cardinal Virtues – prudence, temperance, justice and fortitude – and the eight points represent the eight Beatitudes (or solemn blessings – they can be found in the Bible in St Matthew chapter 5, verses 3 – 10) which result from practicing these virtues. So that the wearer would have a permanent reminder of their training hospital, the symbols between the four arms of the cross are from the coat of arms of St Thomas’ – a Tudor rose, fleurs de lis and the shield with the sword of St Paul. In the centre of the badge is a relief of the head of Florence Nightingale with the words ‘Schola Sancti Thomae’. Until 1965 the badges were made of silver but since that date, a silver coloured metal has been used. 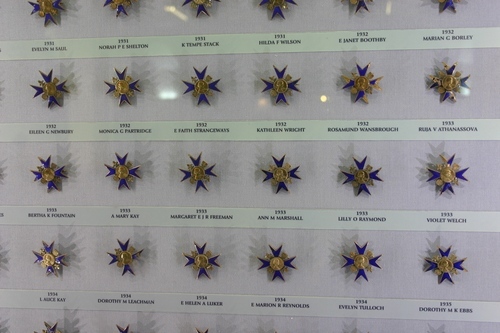 The badge is enamelled in blue, the colour of the ribbon of the Order of Merit awarded to Florence Nightingale. Each badge is engraved on the reverse with the name of its owner and the year in which it was awarded"1. 1. Retrieved from The Nightingale Fellowship official website.